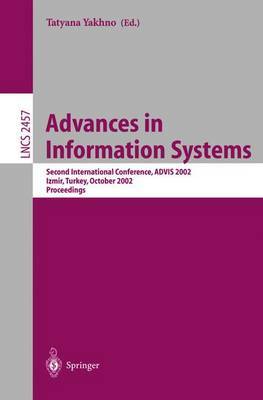 This volume contains the proceedings of the Second International Conference on Advances in Information Systems (ADVIS) held in Izmir, Turkey, 23-25 October 2002. This conference was dedicated to the memory of Prof. Esen Ozkarahan. He was a great researcher who made an essential contribution to the development of information systems. Prof. Ozkarahan was one of the pioneers of database machine research and database systems in Turkey. This conference was organized by the Computer Engineering department of Dokuz Eylul University in Izmir. This department was established in 1994 by Prof. Ozkarahan and he worked there for the last ?ve years of his life. The main goal of the conference was to bring together researchers from all around the world working in di?erent areas of information systems, to share new ideas and present their latest results. This time we received 94 submissions from 27 countries. The program committee selected 40 papers for presentation at the conference. During the conference a workshop was organized on the topic "New Information Technologies in Education". The invited and accepted cont- butions cover a large variety of topics: general aspects of information systems, databases and data warehouses, information retrieval, multiagent systems and technologies, distributed and parallel computing, evolutionary algorithms and system programming, and new information technologies in education. The success of the conference was dependent upon the hard work of a large number of people. We gratefully acknowledge the members of the Program C- mittee who helped to coordinate the process of refereeing all submitted papers.